Computer-based education and "edutainment" (education + entertainment) have always been a focus for STLi. In 1996 we developed our first Web-based training system, Train & Track, which encompassed many bold new ideas in the areas of curriculumn presentation and student evaluation. 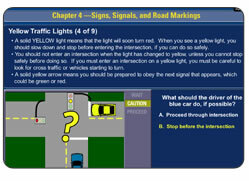 In 2002, we worked on a major pilot study with the California DMV which proved that computer-based driver education was just as effective as textbook-based. Since then, we’ve expanded our content management technologies, allowing teachers to easily create new tutorials on the fly. Lessons can include video, sound, animation, and engaging interactive exercises. Randomized, multiple-choice quizzes are generated from a data-bank of questions. Our training interfaces are always simple to use and don't get in the way of your students ability to focus on the curriculumn. To accompany the lessons, we can also integrate moderated email facilities or message boards to encourage communication between students, teachers, parents and/or mentors, all in a monitored environment. Contact us to learn more about our custom online training systems and interactive curriculumn development. 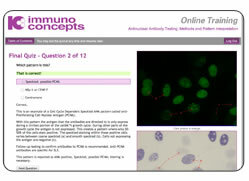 We designed a modular training system for Immuno Concepts in which new courses can be added and updated at any time. Teachers can monitor which quiz questions are stumping students, allowing them to revise course content as needed. In our interactive DMV Driver Ed program, students are presented with tutorials containing text, animations, videos, diagrams, and photos. They are asked to interact with the animations by making decisions on what the driver should do. Student must pass a quiz before continuing on to the next chapter. 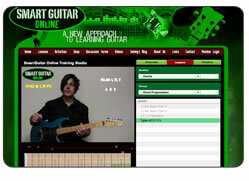 Developed closely with music educator and professional guitarist Tommy Armstrong-Levitt, Smart Guitar Online is an innovative new system for learning guitar. The site combines instructional videos with synchronized and animated visual aids, fingertip control of videos and loops, quizzes, full-band backing tracks, and more.